There are two types of cyclists on Alpe d'Huez: the ones who need to do it fast, and the ones who just need to do it. Whether you are a pro or a bucket-lister - nobody wants to embarrass themselves, everyone wants to make it to the top, and certainly everyone can (at their own speed). This short 8.6 mile climb will make you feel like a King of the Mountain. 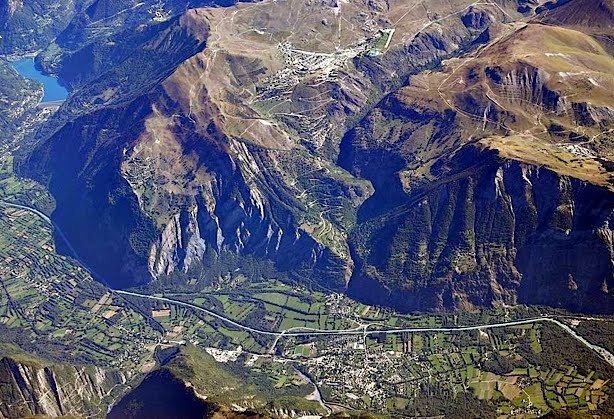 Whether you are a racer, cyclist, spectator or driver ascending the famous 21-hairpin bends of this iconic (yes I used the word) mountain, you will experience why there truly is no other place, or climb, on earth like Alpe d'Huez. 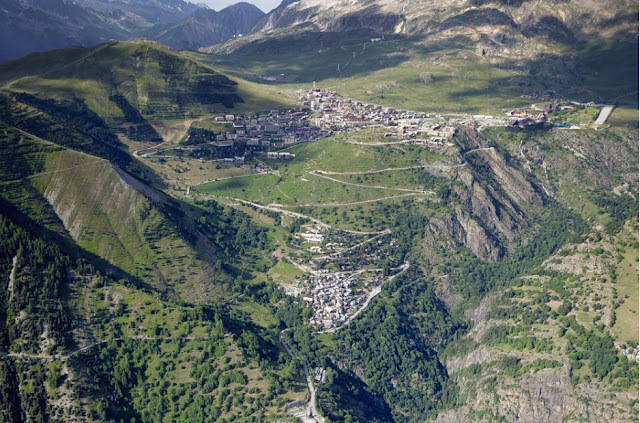 Restaurants, hotels, markets, bike shops and outside patios located in Le Bourg-d'Oisans at the base of the climb. Outdoor activities, outdoor patios, and some hotels open in summer, up in the villages at top. Romans mined here for silver, copper, zinc and coal thousands of years ago on the high pasture slopes. Electricity, roads, and the first cable car were built later for modern day silver and coal miners. Skiers discovered the slopes in 1911. The ski village atop opened in 1936. Trees were cut and avalanches became more common, in 1950 the miner's dormitory was destroyed by an avalanche and 12 men were killed; the mines were closed shortly after. The valley has quite an involved history during WWII, recovering quickly to become a fashionable vacation spot post-war. 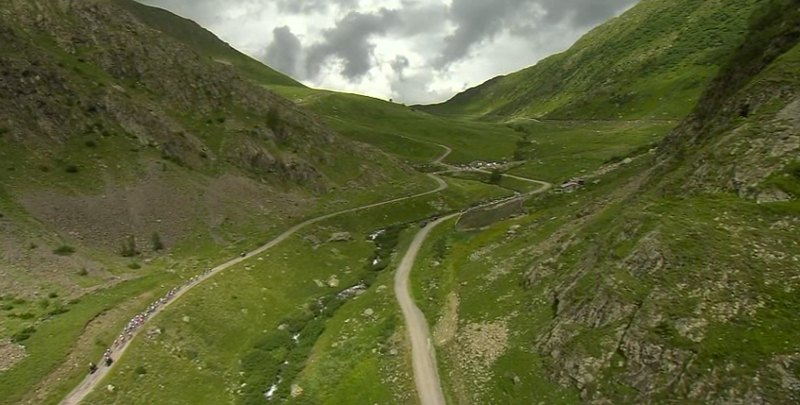 Make it Lucky #29: the number of times the Tour de France has included this climb since 1952. Come join the over one million people capable of loading onto this hillside during the next Tour day on July 25, 2015. Colorful, costumed spectators come days in advance in white camper vans and tents; parading upward the day of the race to fill every nook and cranny. Various flags fly and foreign accents overheard from countries around the world - all to seewhose name will next be added to a signpost on one of the 21 hairpin bends and forever enter history as a stage winner on Alpe d'Huez. In 1979 the climb was included in two different stages of the same Tour. The 2001 and 2004 titles have been vacated (striped). 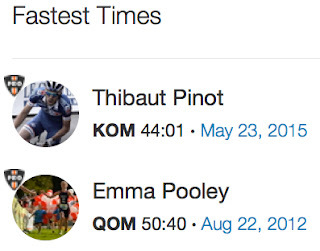 In 2004 there was an individual time trial up the mountain. 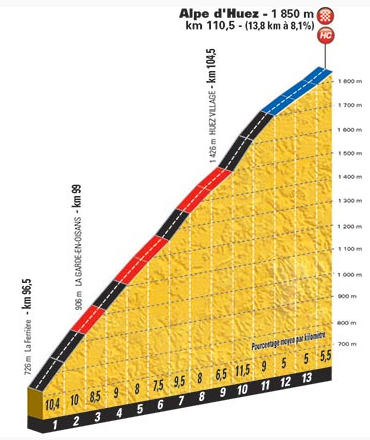 In 2013 the climb was included twice in the same stage. The first climb up Alpe d'Huez in the Tour de France was won by Fausto Coppi in 1952. 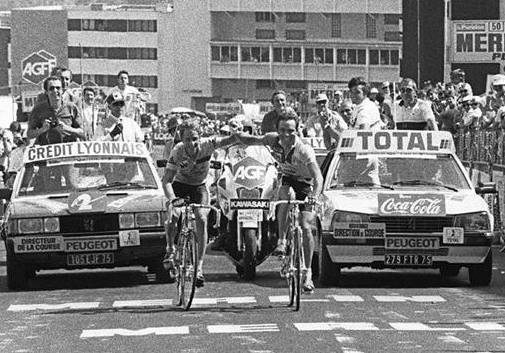 One of the most famous cycling photographs was captured on Alpe d'Huez in 1986 when Greg Lemond and Bernard Hinault grabbed hands over the finish line. They are rightly called "hairpin bends;" must use both words to describe the steep switchbacks. The most striking thing about the majority of the hairpin bends, is that the corners are relatively flat-ish and the ramps are not flat at all - they indeed ramp up so steeply, to a cyclist, it feels as if your handlebars are suddenly thrust toward your face. The corners make the climb exhilarating, the changing views and signposts entertaining. All this is good because right when you think you've finished a set of bends, the next set suddenly appear before you, then the next. 8.6 miles never felt so long. When you see signpost #1, start celebrating - you have climbed Alpe d'Huez! Bend # 14 - (8) Bret Breu, and (29) Thibaut Pinot ! Andy Hampsten's name is on Sign #5 of 21 signs on Alpe d'Huez. ©Photo by Karen Rakestraw of PedalDancer® I must have been continuing to ride my bike past the sign, because that sure is blurry! Corner #7 is famously called The Dutch Corner. Orange clad spectators by the thousands clammer, stammer and hammer in this corner for all things Dutch. Dutch corner has been going strong (and gaining) since the 60s. Video: Alpe d'Huez's Dutch Corner, By Bicycling with Frankie Andreau, and also Tour De France 2013 - Alpe D'Huez - With The Fans At Dutch Corner, By GCN. Across from the orange madness, sits a church. Any cyclist who has climbed Alpe d'Huez knows that the site of this chapel means you are nearing the top of the climb. It is a landmark well remembered. 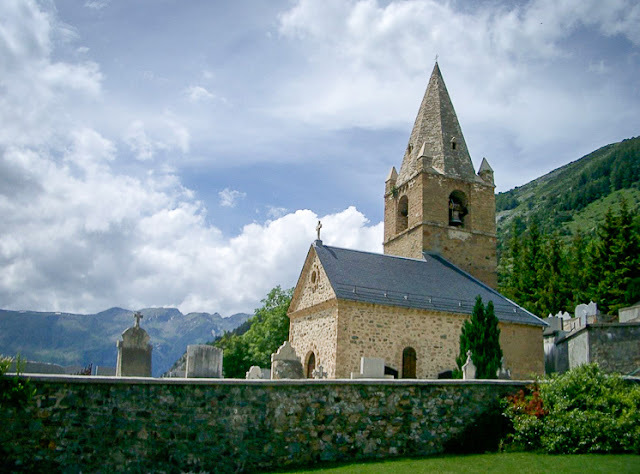 The name of the picturesque chapel is Church of Sainte Anne and is located in Huez Village at 1450m. The church still offers services on the first Saturday of every month in the early evening. The church also organizes a special Saint Anne's Feast Day in July. The festival is organized by Huizats (the inhabitants of Huez, that's true) to honor the patron Saint of Huez. The festival includes painting stained glass, trout fishing, a meal in the countryside, a ball, a traditional costume parade, a boot fair, and a mass. The traditional approach is directly up the front side. Col de Sarenne is an optional small road down the back side (south side). The two roads adjoin at signpost #4. If climbing up, stay left for the traditional climb to the top, stay right for the road to the back way off the mountain, which winds along a small rough balcony road with dark tunnels and more climbing. 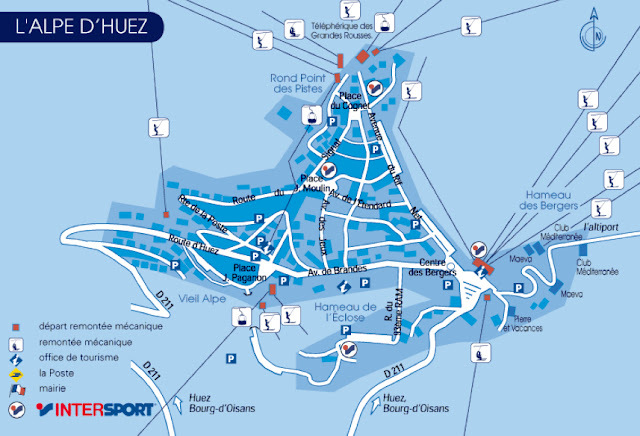 You may officially record your time up Alpe d'Huez the old fashioned way - by purchasing a card from the Le Bourg-d'Oisans Tourisme Office in town, at the base of the climb, and punching your card in the machine near the #1 signpost at the top. The old cards are a fun souvenir. 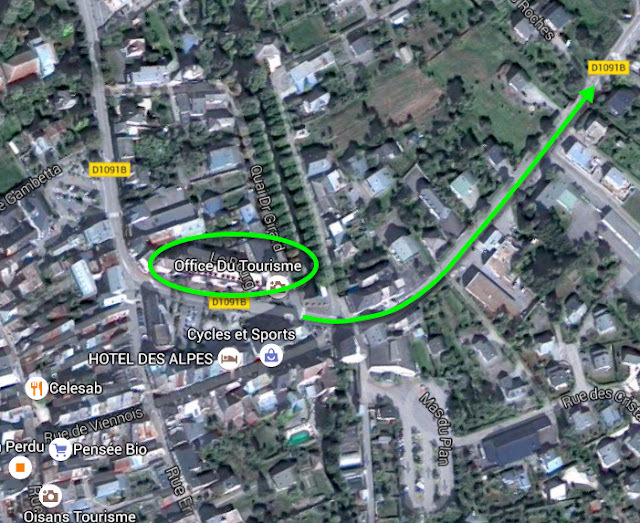 Location of Office de Tourisme. 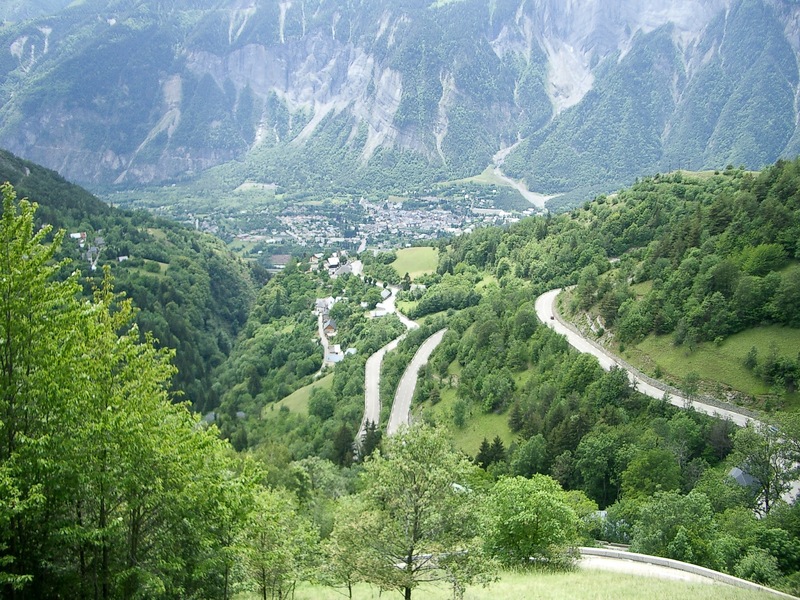 This way through the town of Le Bourg-d'Oisans to Alpe d'Huez, or follow the signs. 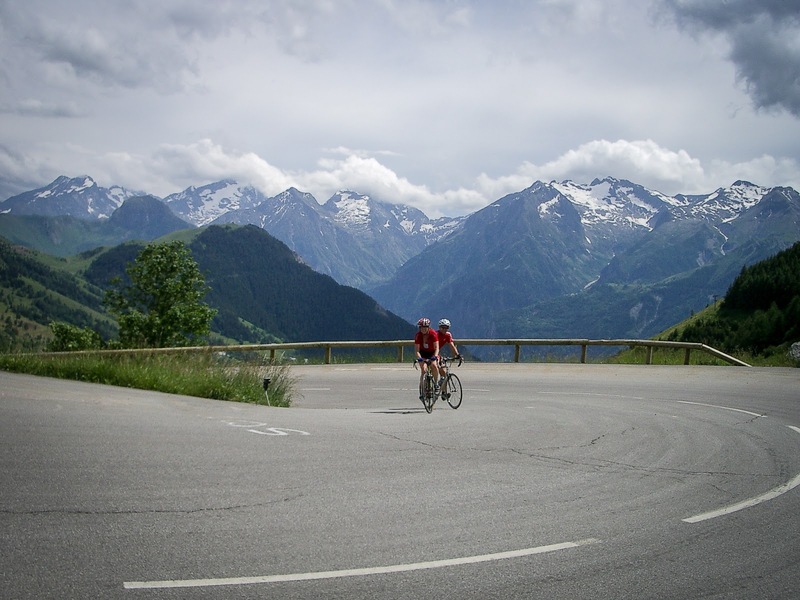 Starting annually in Bourg D’Oisans, the famous amateur sportive of La Marmotte climbs the Col du Glandon, Col du Telegraphe, and Col du Galibier, before finishing up Alpe D’Huez. All in one day! In July, 170 km and 5100 m height gain, 7500 participants, more information. Nearest airport: Grenoble, 90 minutes (105km). 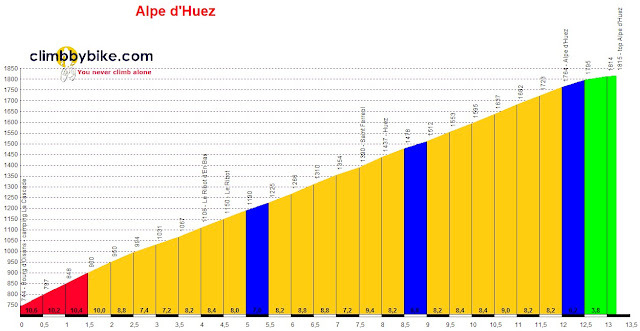 I have been very fortunate to have climbed Alpe d'Huez twice, the first time in 2003 during a stage of the Tour de France, and again in 2007 on a non-Tour day (ride report). Both were enjoyable but quite different. A Tour day on the climb is a mad-house, with space allowed for the riders to pass reduced to mere centimeters. A non-tour day allows for time to read the signs, take pictures and enjoy a cool drink at a cafe at the top. 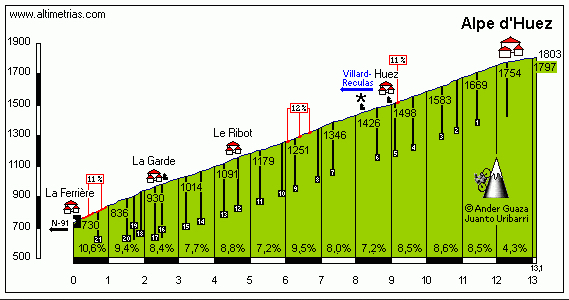 Starting in Le Bourg-d'Oisans, the first two turns are a long steep and intimidating at 13%, but the grade lessons to 8%. Don't become discouraged at the bottom, it gets better. Descending is fabulous fun. Most striking is that the corners are flat and the straights are jarringly steep. This is the opposite of mountain road construction in the United States. It is a thrilling climb. Unless you are racing it for an official time, why rush. 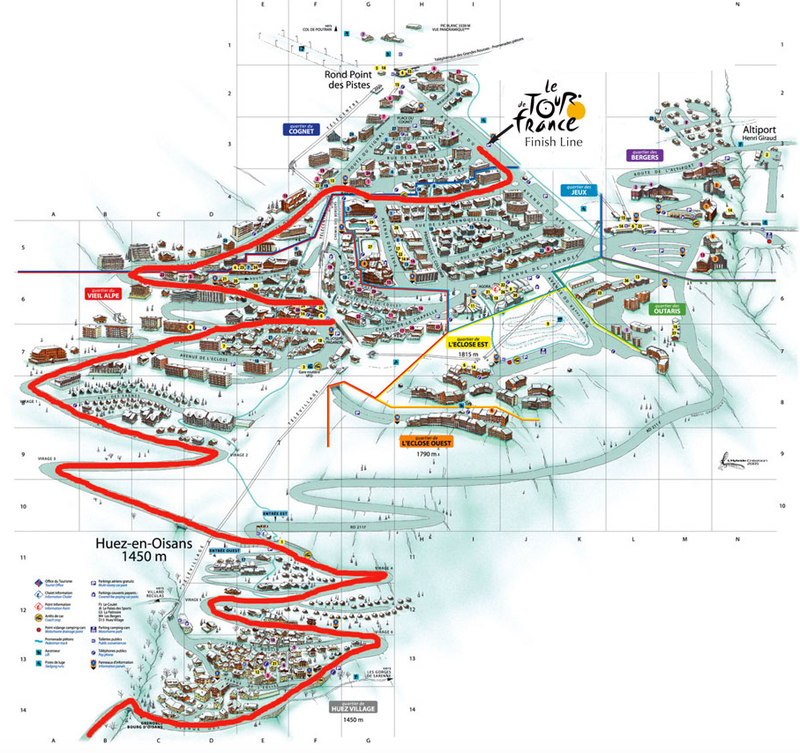 HOW TO: So you want to climb Alpe d'Huez? 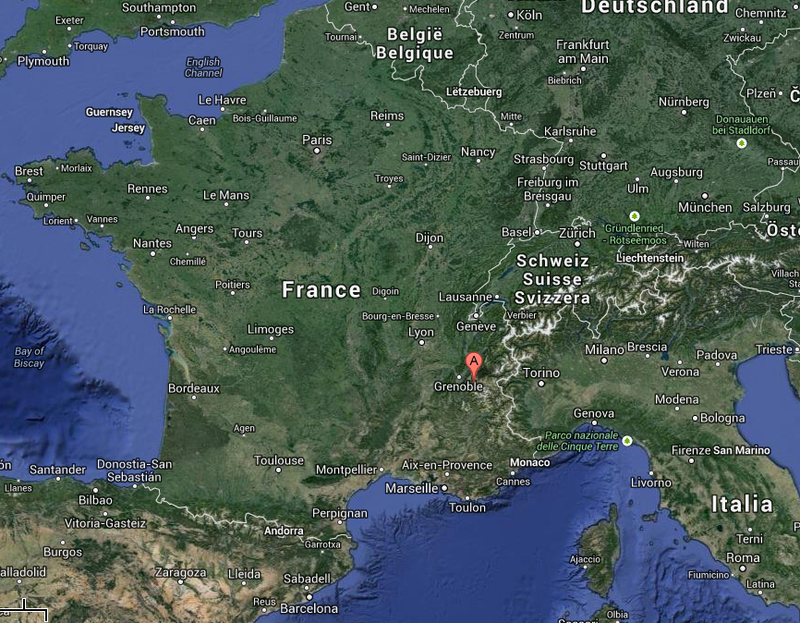 - Fly or train to Grenoble (Geneva is the largest airport nearby, I prefer the smaller convenient Lyon Airport). Stay: near Le Bourg-d'Oisans. Climb: Alpe d'Huez, Col de Sarenne, Les Duex Alpes, Col d'Ornon, Col du Glandon, Col de la Croix de Fer, Col du Madelaine, Col du Galibier, Col du Lautaret, Col du Telegraphe, and cycle through the Vercours. 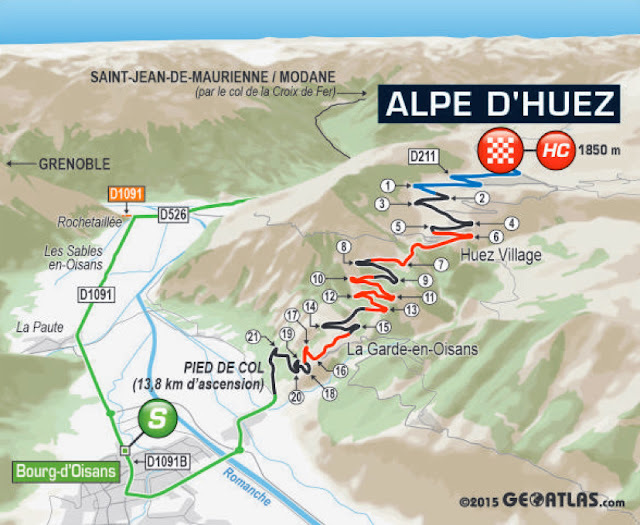 For more information about Alpe d'Huez in the 2015 tour de France, please see the Stage Preview at the bottom of this post: Stage 19 TDF: Haven't we seen this before? & Stage 20 Preview.